Back in October BBM released the fourth in their series of pack based OB team sets called "Legends". This one (I'd say the latest but they just released one for the Carp a few weeks back) is dedicated to the Lions. 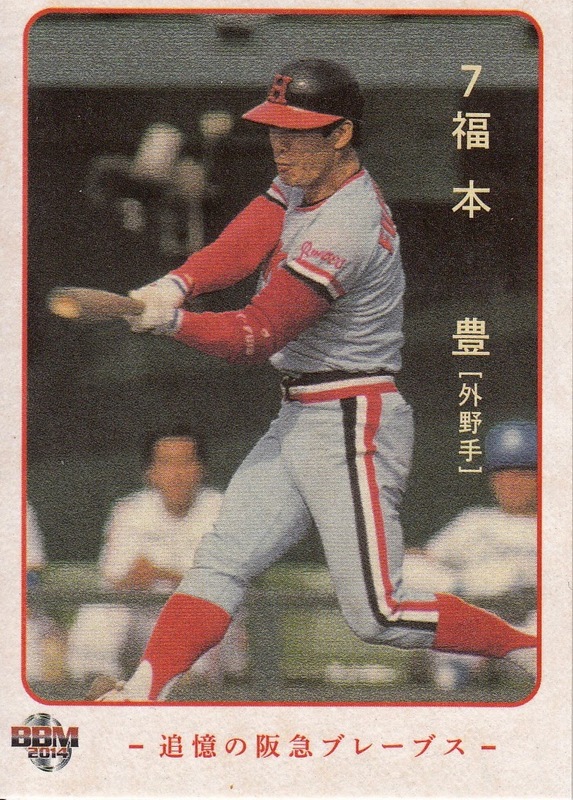 The theme of the set appears to be the era between 1982 and 1994, when the Lions won 11 Pacific League pennants and 8 Nippon Series. There's not a whole lot to be said about the set. 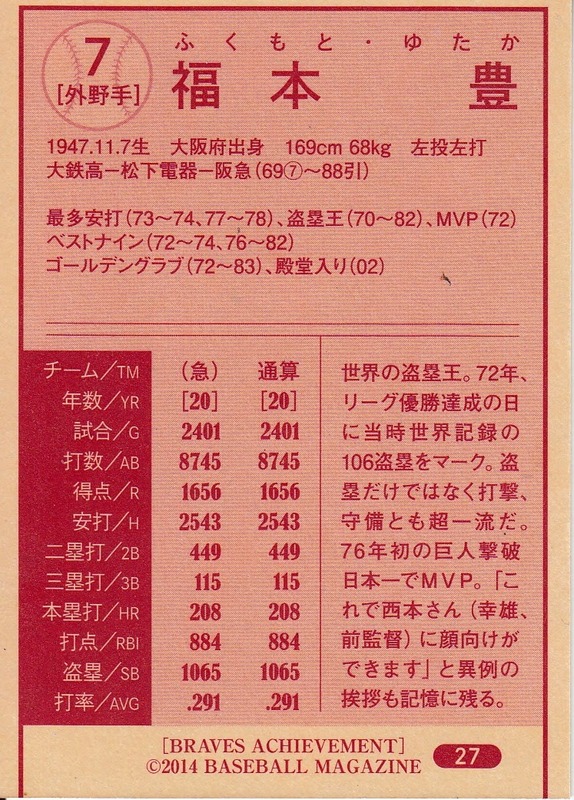 It's 81 cards and all the cards are of Lions personnel from that era, including their two managers from that period - Tatsuro Hirooka and Masaaki Mori. There are no subsets of any sort in the set. 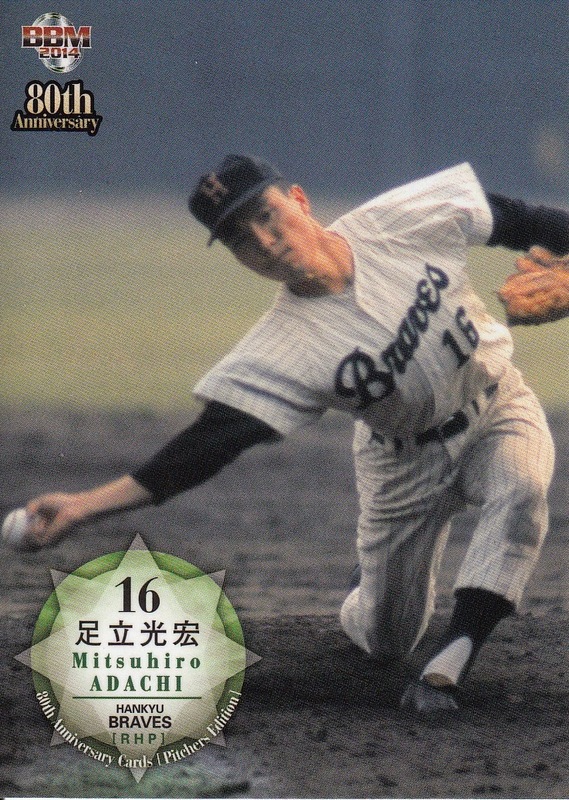 The players appearing in the set include a number of big stars including Koji Akiyama, Tsutomu Itoh, Kazuhiro Kiyohara, Kimiyasu Kudoh, Hiromichi Ishige, and Koichi Tabuchi. 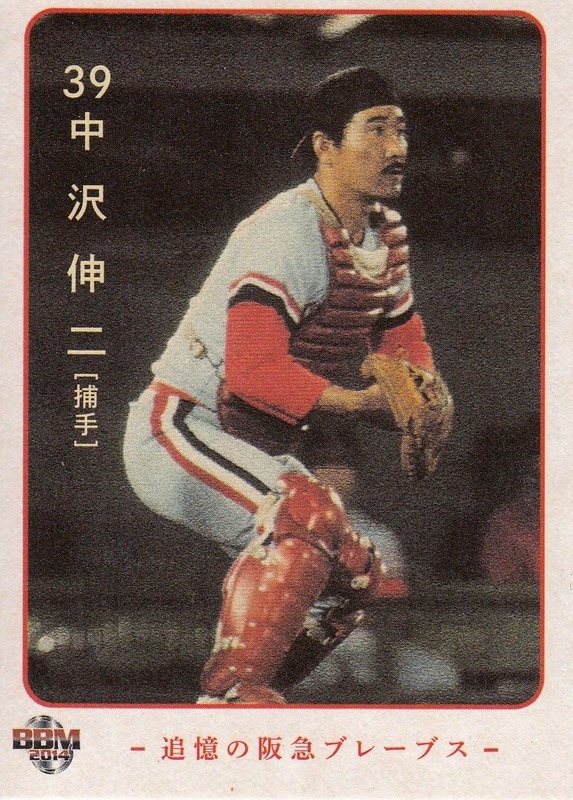 The set also includes Masahiro Doi and Katsuya Nomura, who actually had retired before 1982. 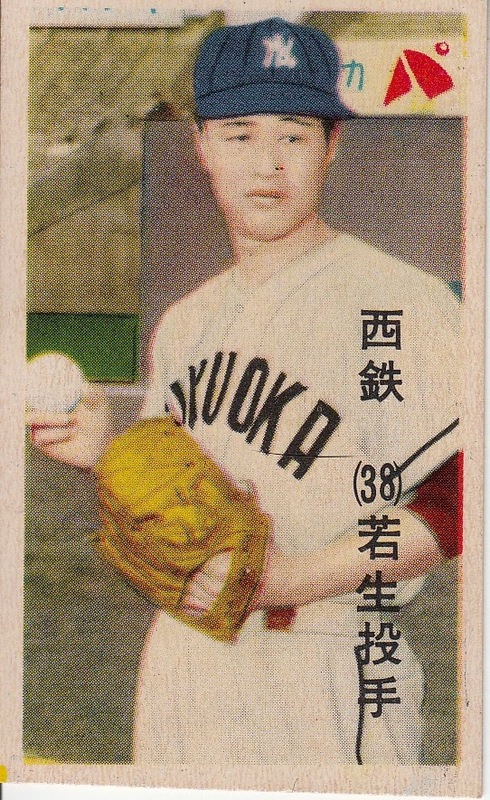 The set also includes one player who is still active - Kazuo Matsui. 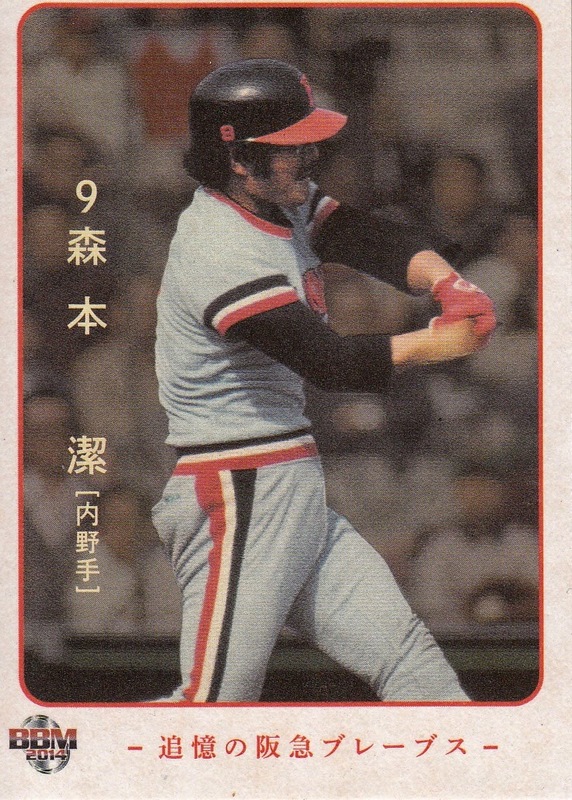 There are several gaijin players in the set - Orestes Destrade, Steve Ontiveros, Ty Van Burkleo, George Vukovich and Terry Whitfield. I believe that these are the first BBM cards ever for Vukovich and Whitfield. 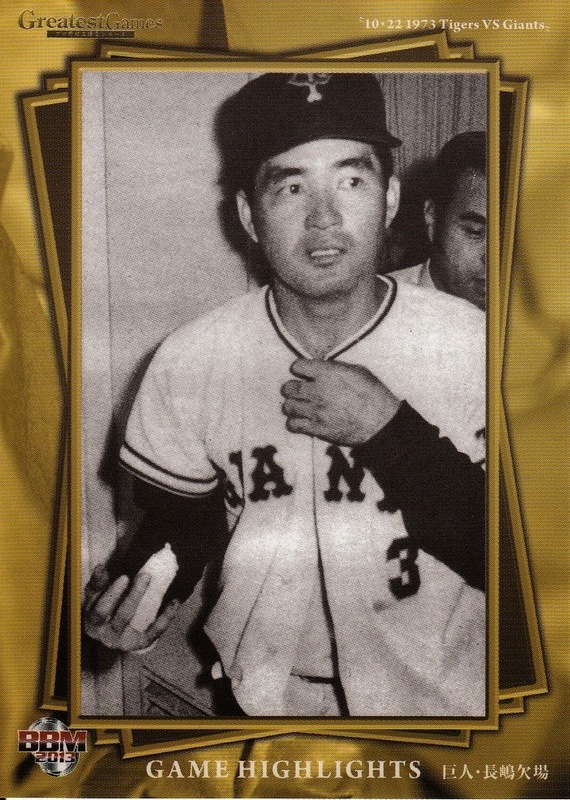 The biggest name that I see that is missing from the set is Hall of Famer Osamu Higashio. 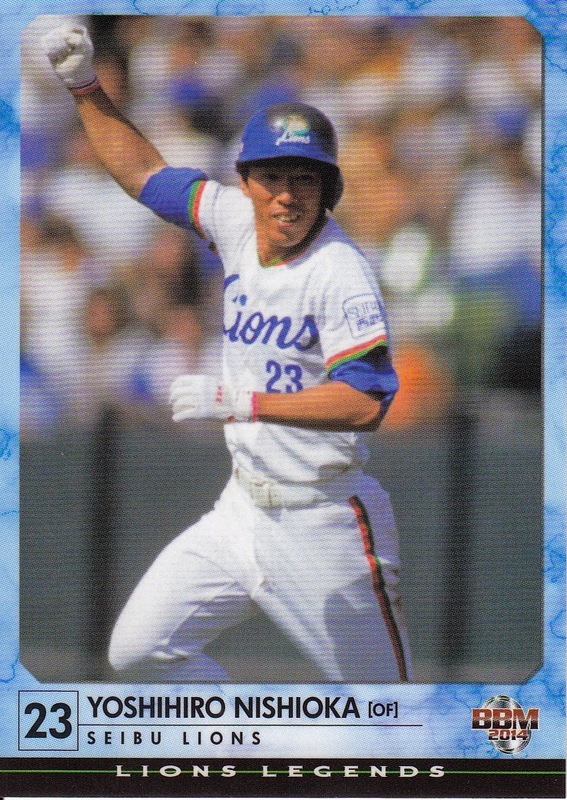 Yutaka Enatsu is another big name that could have been included but he only spent one year with the Lions at the end of his career. The cards themselves are reasonably attractive. They use the same design as the previous sets in the "Legends" series with a different border color. There's a pretty good variety of types of photos although they're a tad on the grainy side. This is another set that looks better in person than it did on line at Jambalaya. Now that I see all the cards at once, I can see that they aren't all the same. But they certainly look like they were taken at the same time in a sequence. I've arranged these cards in what I think the sequence is - I figure the Braves Achievement card goes between the last two cards. (And I think the first two are actually the same shot). 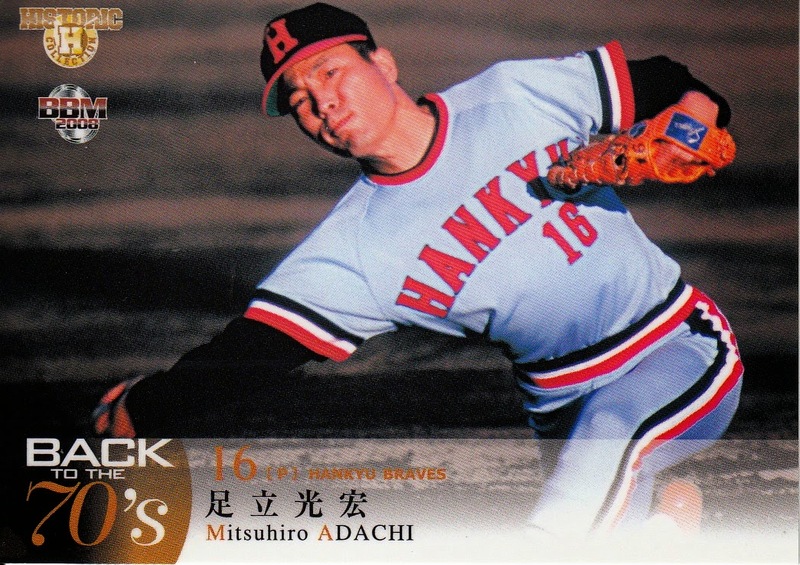 There's only five other cards of Adachi that I'm aware of - two Calbee cards from the 1975/76 set, BBM cards from the 2004 Golden Arms and 2006 Record Makers sets and a card in the new OB Club 20th Anniversary set Part 2 that was released in the past week. As far as I can see, none of them use the image. This Yahoo! Japan Auctions search may show you more of his cards. BBM has started a new series of OB team box sets. The official name for the sets appears to be "Achievement" but it looks like BBM is also marketing them as "Memories Of...". 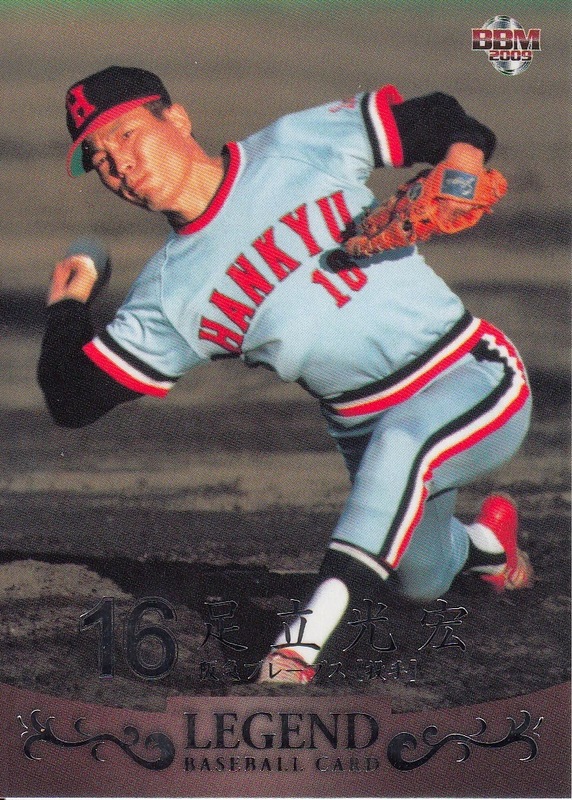 The first two sets came out in October for the Hankyu Braves (now the Orix Buffaloes) and the Nankai (now Fukuoka Softbank) Hawks. 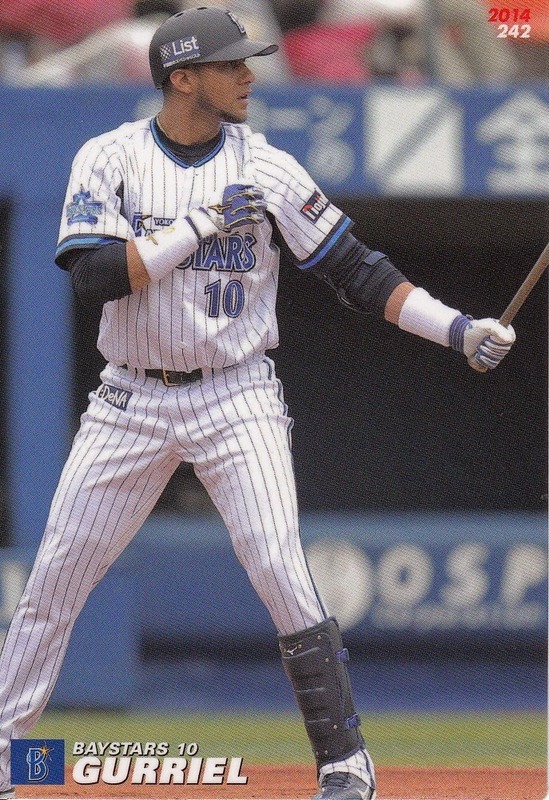 Two more sets were released a few weeks back for the Kintetsu Buffaloes and the Taiyo Whales (now the Yokohama DeNA Baystars). As you can see, the fronts feature no English, just a column of text containing the player's number, name and position (in parenthesis). As Ryan points out, this is very similar to a lot of the old menko from the late 1950's and early 1960's. The photos have been processed (Instagram filtered?) a bit so they aren't as clear as BBM photo's normally are. 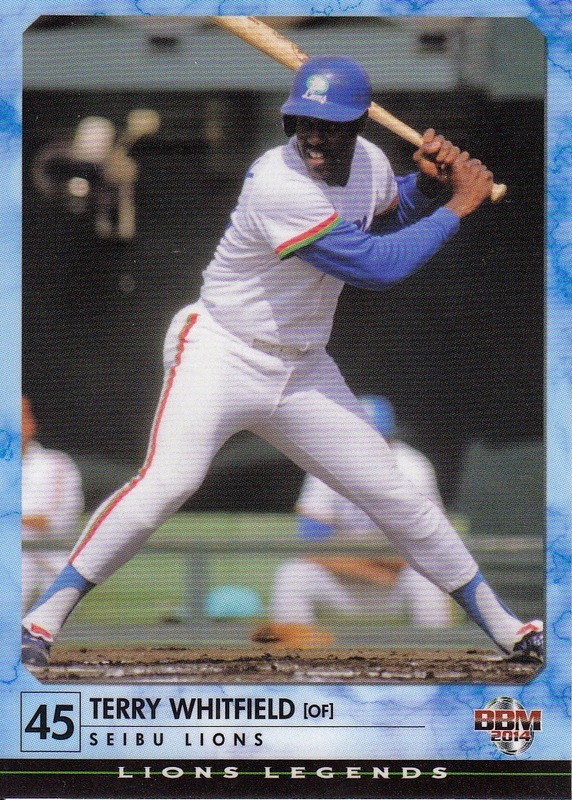 The significant thing about the backs (besides the fact that they don't have the player's picture on it unlike most BBM issues) is that they feel like the back of old (pre-1992) Topps cards. I half expect to find a card with a bubble gum or wax stain on it. As for the set contents itself, it's a decent representation of the 1970's & 80's era Hankyu Braves. 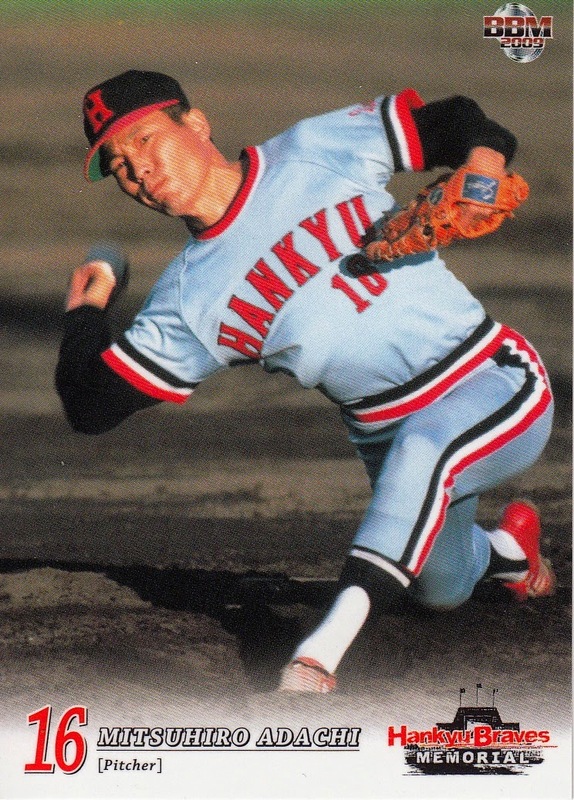 The main stars (Hisashi Yamada, Yutaka Fukumoto, Takashi Yamaguchi, Hideji Kato, etc) are included as well as the significant foreign players (Bobby Marcano, Boomer Wells and Bernie Williams). The set also includes manager Toshiharu Ueda. My only real complaint with the set isn't really about the set - it's just that this era of the Braves has been mined for OB sets by BBM a couple of times already in the last five years. I should mention that the unopened box comes with a plethora of possible autograph cards, both authentic and facsimile. I, as usual, got an opened box. Ryan has already done a post on this set (as well as the Hawks set) and you can see all the cards at Jambalaya. 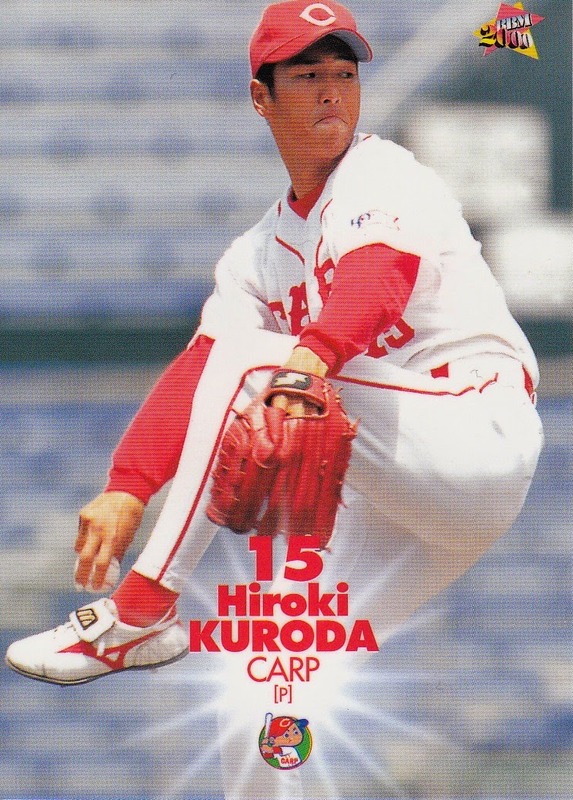 After seven seasons in MLB, Hiroki Kuroda is returning to Japan and the Hiroshima Toyo Carp. 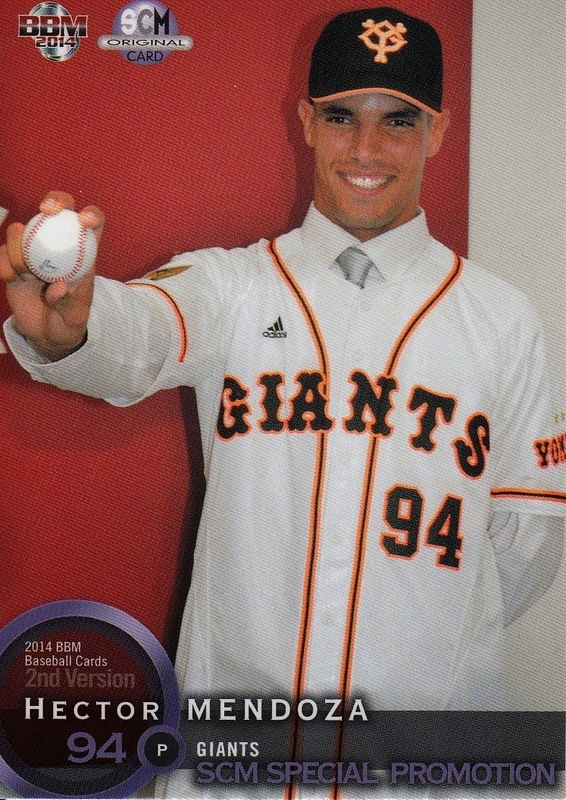 One of the most interesting events of the 2014 NPB season to me was the Cuban government allowing four of the nation's baseball players to play in Japan. I thought I'd do a quick summary of the Japanese cards available for these four players. I'll list every card I know about and show the ones that I actually own. 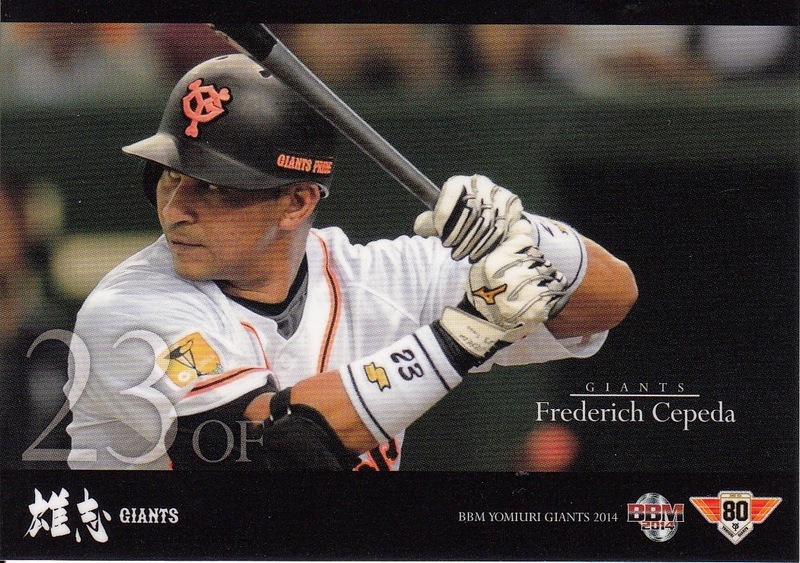 The first player to arrive was Frederich Cepeda, who joined the Giants in mid-May. 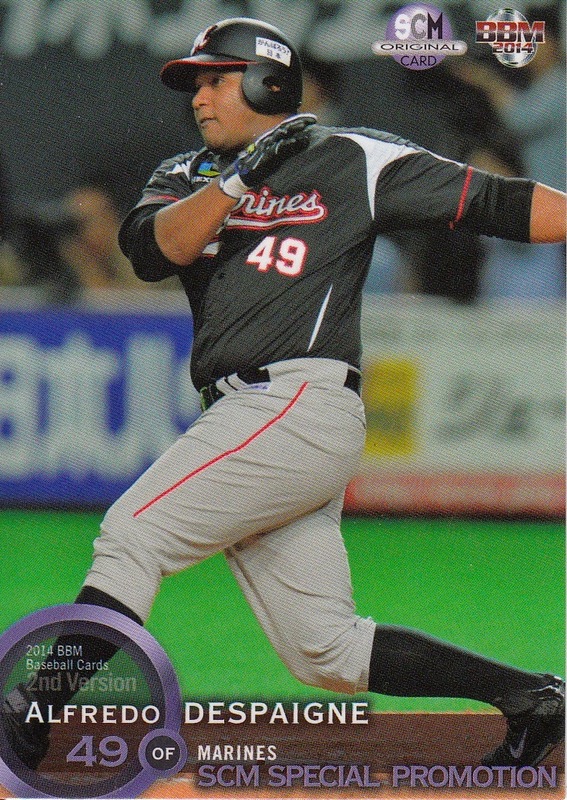 Cepeda's first appearance on a card was in the BBM Giants team set (#G057). His first "flagship" set appearance was in the 1st Version Update subset of BBM's 2nd Version set (#428). He also appeared in Bandai's third Owners League set of the season (#069). 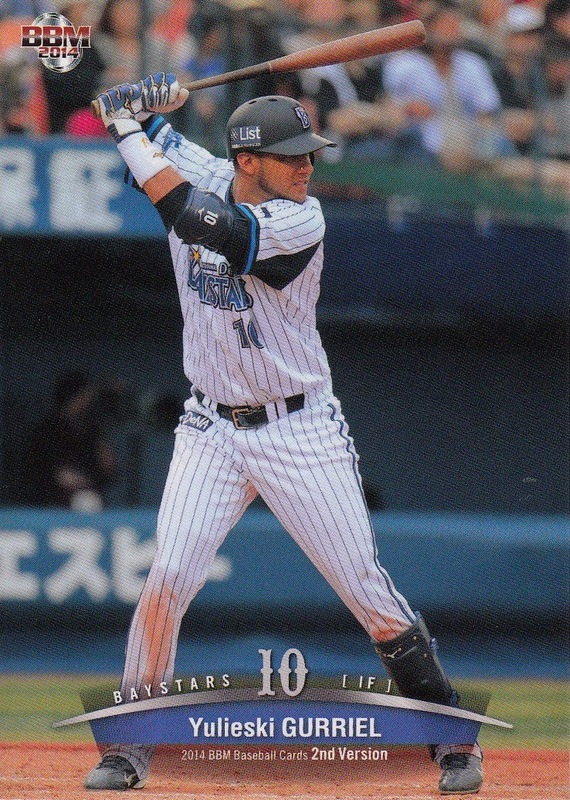 The next player to arrive was Yulieski Gurriel (really Gourriel), who joined the Baystars in early June. With six cards, Gurriel had by far the most of any of the Cuban players. Like Cepeda, his first BBM flagship card was in the 1st Version Update subset of the 2nd Version set (#439). 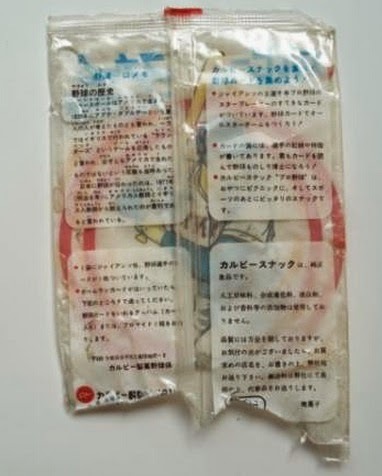 However he also appeared in BBM's Genesis high end set (#094) and Calbee's Series Three (#242). 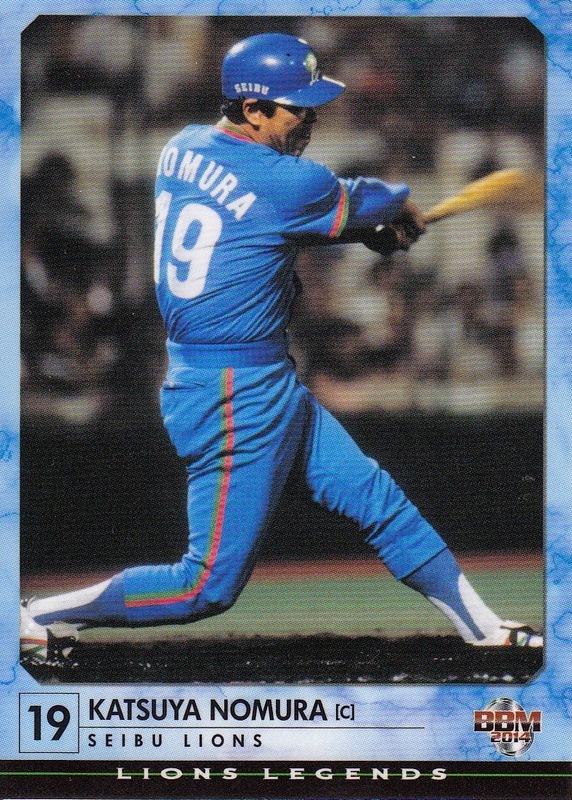 He also was in the BBM Classic set (#063), Bandai's third Owners League set (#111) and Front Runner's Baystars Signature Edition box set (#07). 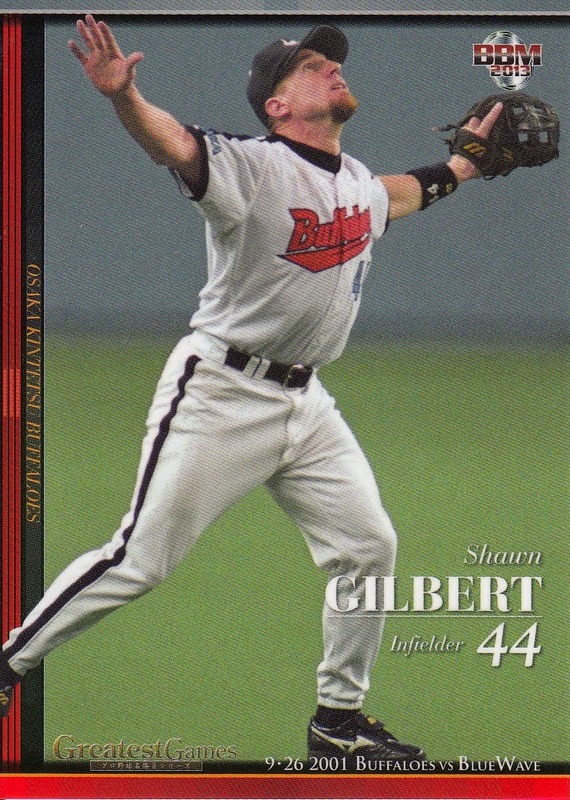 I think he also had autograph cards available in the BBM Genesis and Classic sets as well as the Front Runner set. There's at least one type of memorabilia card for him in the Genesis set and there are probably parallel issues for the BBM cards also. 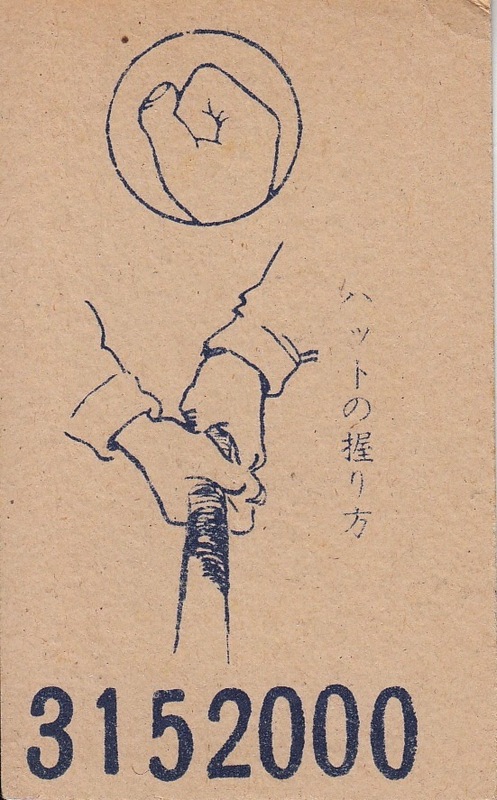 There are also apparently a couple Baystars fan club cards for him as well. 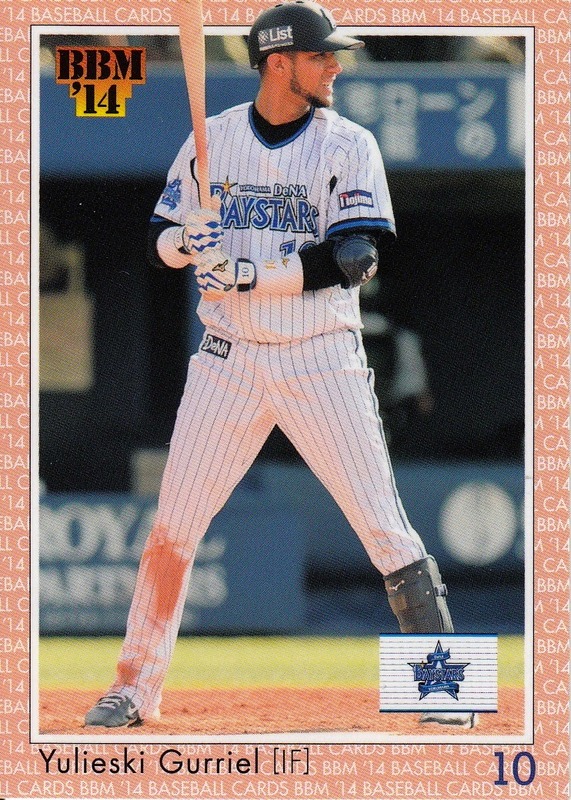 I believe that Despaigne has resigned with the Marines for the 2015 season and Gurriel (along with his brother Yunielkis) is close to resigning wth the Baystars. The last thing I read about Cepeda was that the Giants were not planning on bringing him back for 2015. I think Mendoza has resigned with the Giants but I could not find a confirmation for that. Obviously the decision by the Obama administration a few weeks back to normalize relations with Cuba after 50 years will bring about a very different environment for Cuban baseball players. It will be interesting to see how this will all play out and how this will affect Cuban players coming to Japan in the future. Oh, and I do want to point out that these four were not the only Cuban baseball players in Japan in 2014, but the other players (Leslie Anderson, Juan Miranda, etc) had all defected from Cuba. These four were the only ones who had been allowed by the Cuban government to leave the country. That status makes cards of these four players much more rare than the other players, who have had many major and minor league cards in the US recently. Between fall of 2012 and the end of 2013, BBM issued four box sets in a series they called "Greatest Games". I've written briefly about the first three sets in the series but now that it seems pretty obvious that BBM is not continuing the series, I thought I'd do a post on the whole thing. 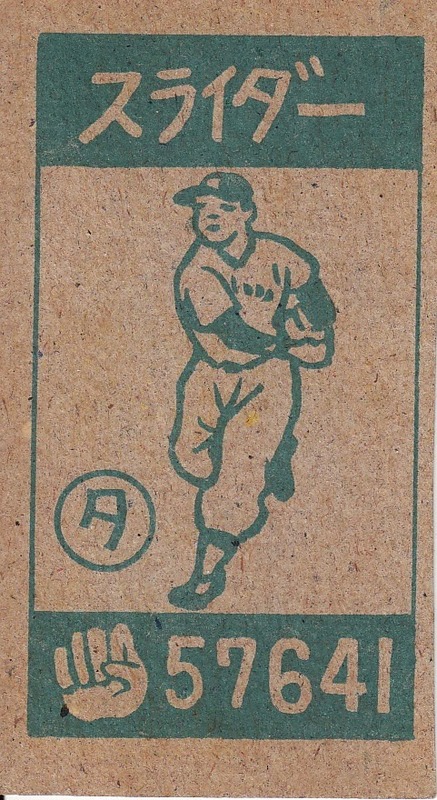 Each of the four sets commemorated a game the BBM considered significant. Each set contains most (if not all) of the players who appeared in the set along with the managers of each team involved. Most of the photos used appear to have been taken at the actual game being celebrated. 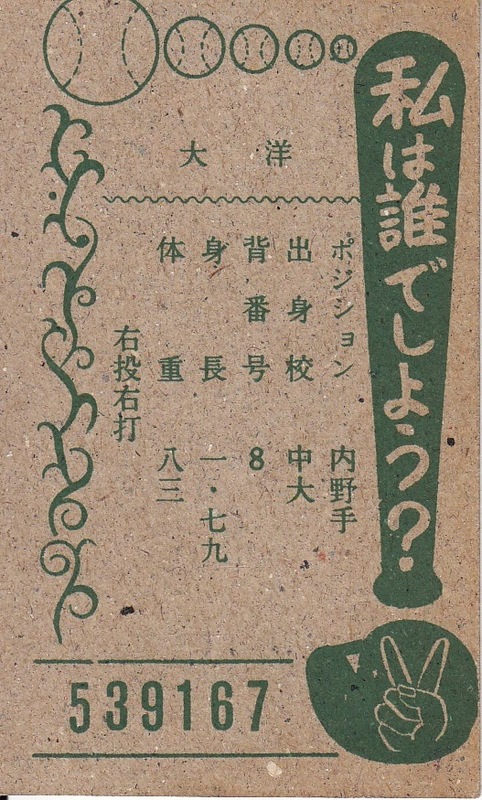 Each set also included one or more cards showing additional events, either directly game related or related to the season of the winning team. As is typical for BBM, each box contained the complete base set (32 or 36 cards) plus one "special" card. Most of the "special" cards were autograph cards (either real or printed) although the first two sets featured other possibilities. BBM picked a game from each of the four previous decades to commemorate, although they did not do them in chronological order. 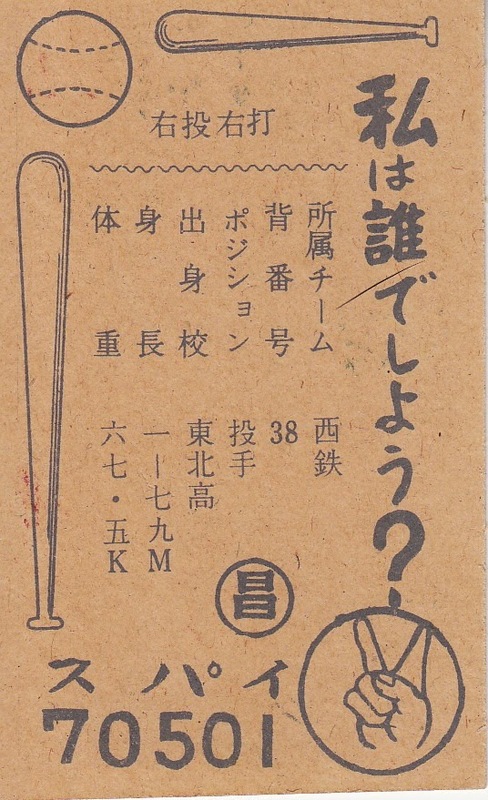 Each of the games determined a pennant winner. 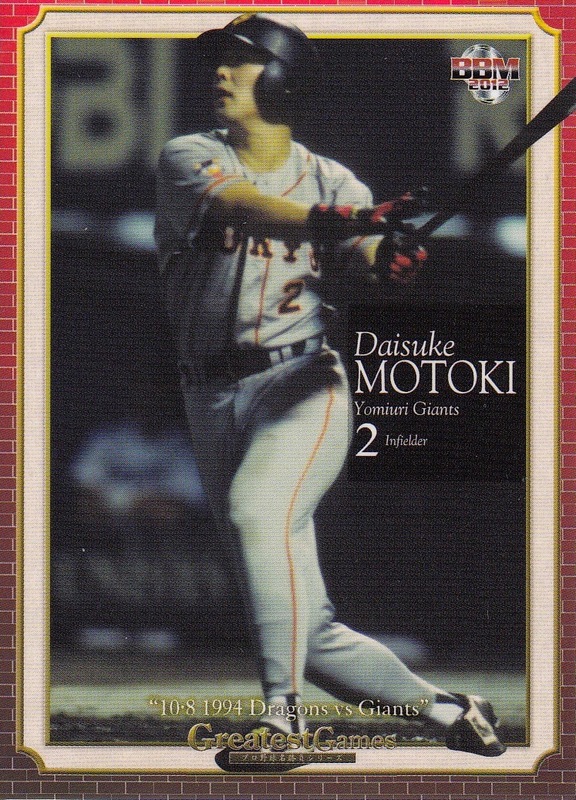 The first set, which was the only one released in 2012, was for the Giants-Dragons game on October 8, 1994. This game was won by the Giants 6-3. 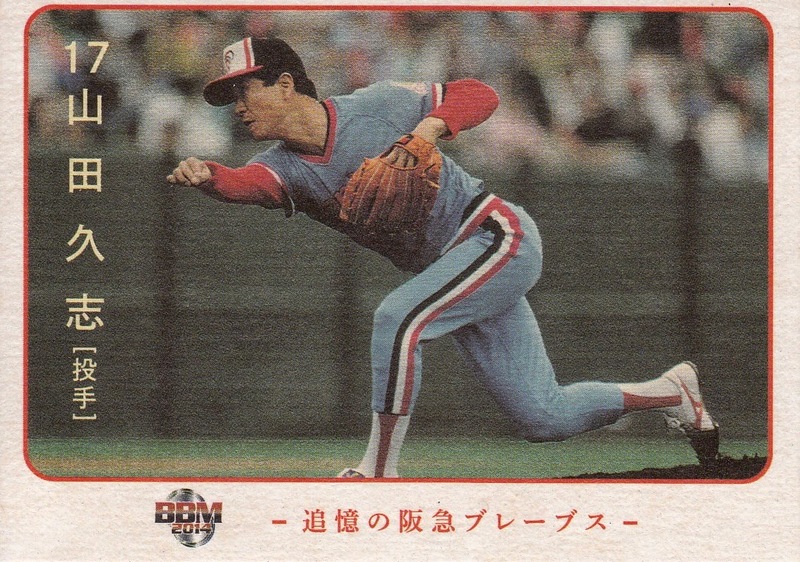 It is significant as it clinched the first pennant for Shigeo Nagashima during his second stint as Giants manager and would lead to his first ever Nippon Series championship against the Lions. 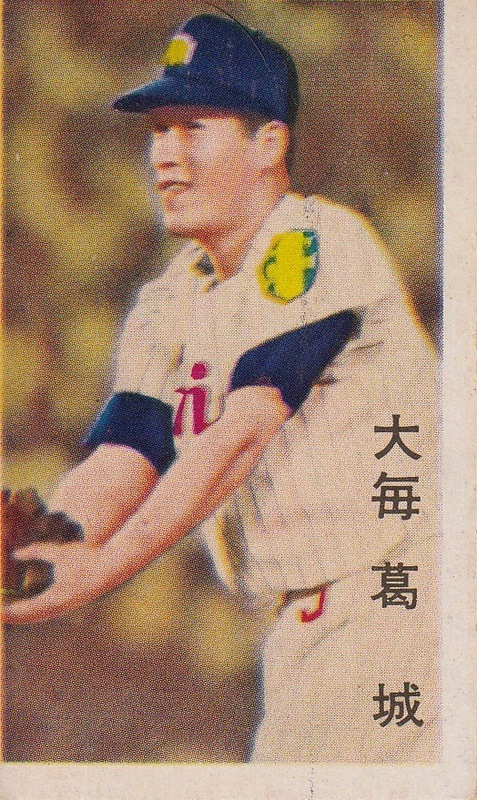 Hiromitsu Ochiai, who hasn't appeared on a baseball card since the Dragons fired him in 2011, played in the game but does not appear in the set (obviously). 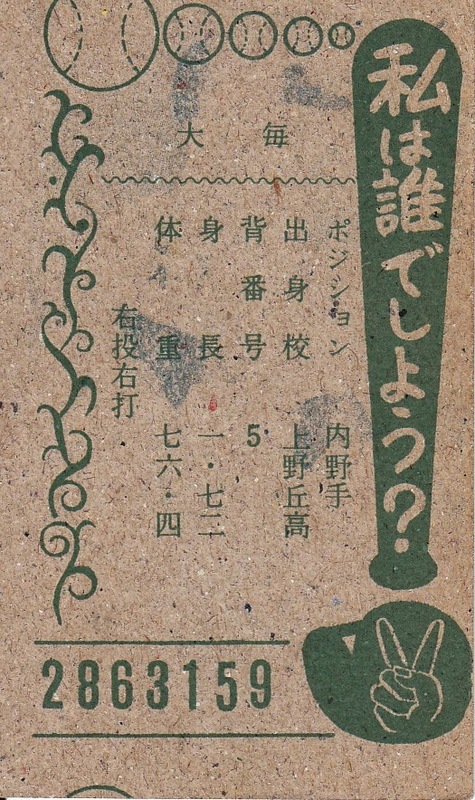 The set featured 10 possible "film" cards as possible "special" cards in addition to the autograph cards. 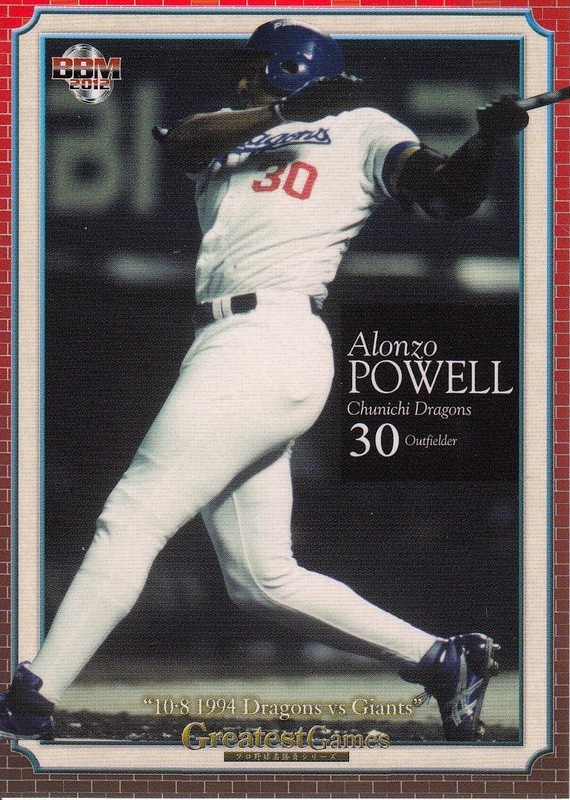 The base set includes 36 cards - 17 Dragons players, 14 Giants players and five cards of game highlights. 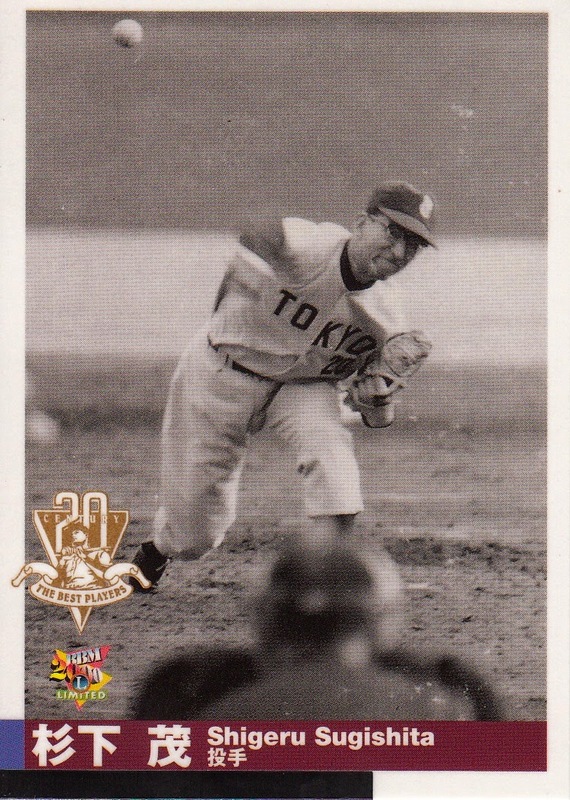 The second set, released in early 2013, was for a Giants-Tigers game on October 22, 1973 (which coincidentally is the day Ichiro Suzuki was born). 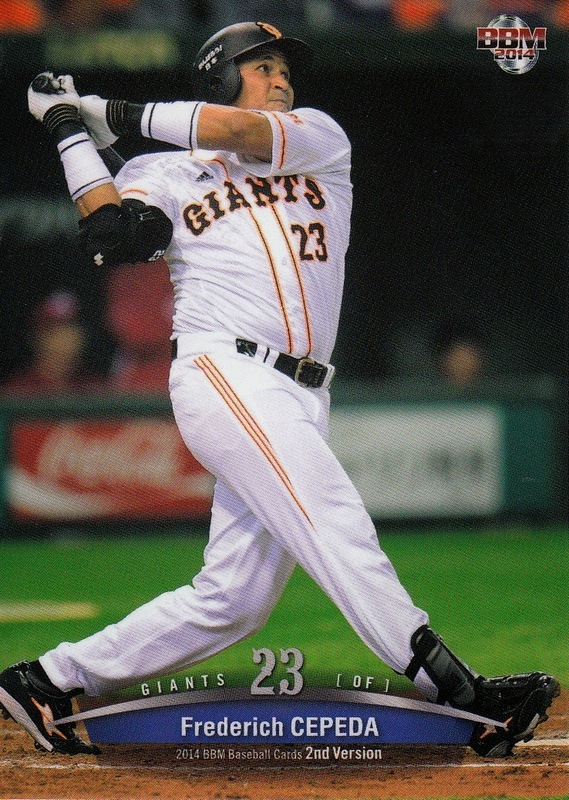 The Giants 9-0 drubbing of the Tigers clinched their ninth straight (and final) Central League pennant of the V9 era. 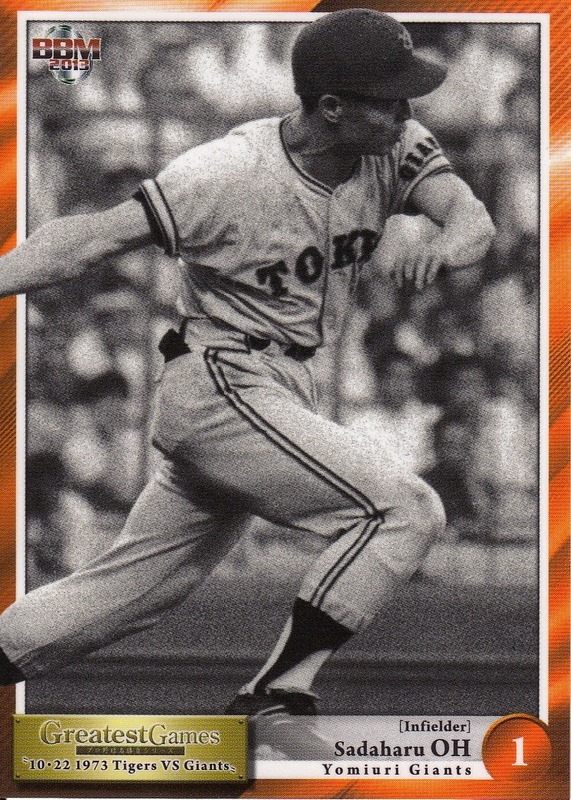 This set also is missing a player from the Giants - Isao Shibata. 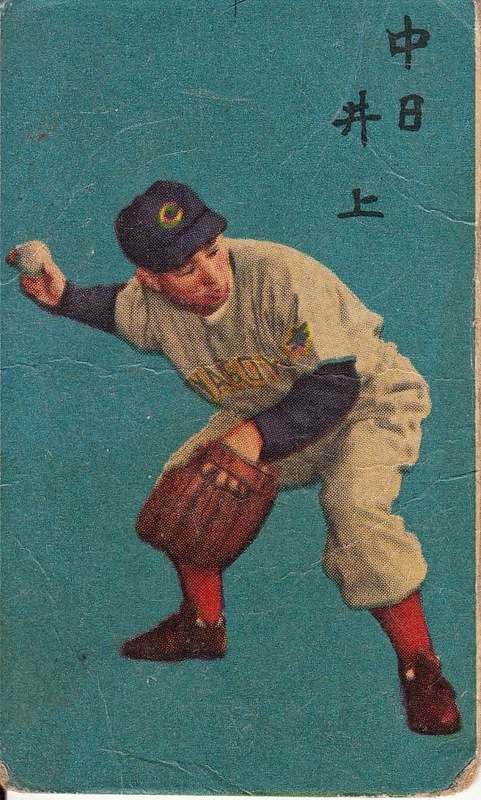 There are 9 cards with a "P" prefix listed on the back of the box as possible "special" cards - I suspect that these are "photo" cards but I haven't found an example anywhere to confirm this. 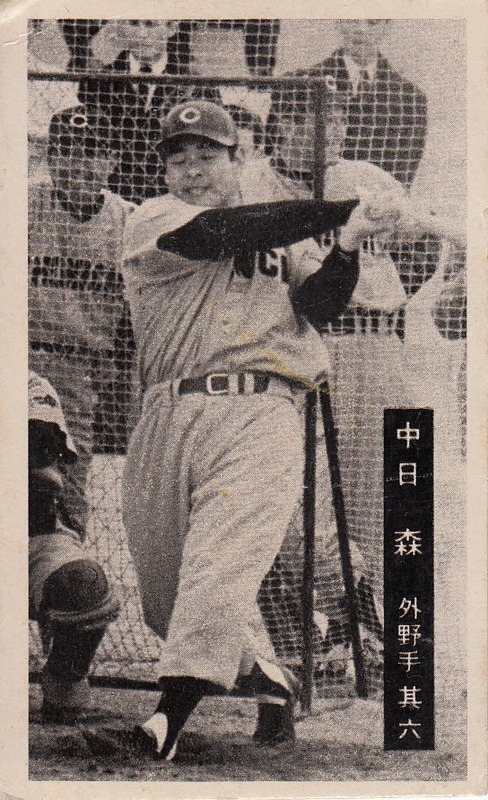 At 32 cards, this set is the smallest of the four sets - 18 Tigers, 10 Giants and four game highlights (more or less - one is a photo of Shigeo Nagashima showing off his broken finger). 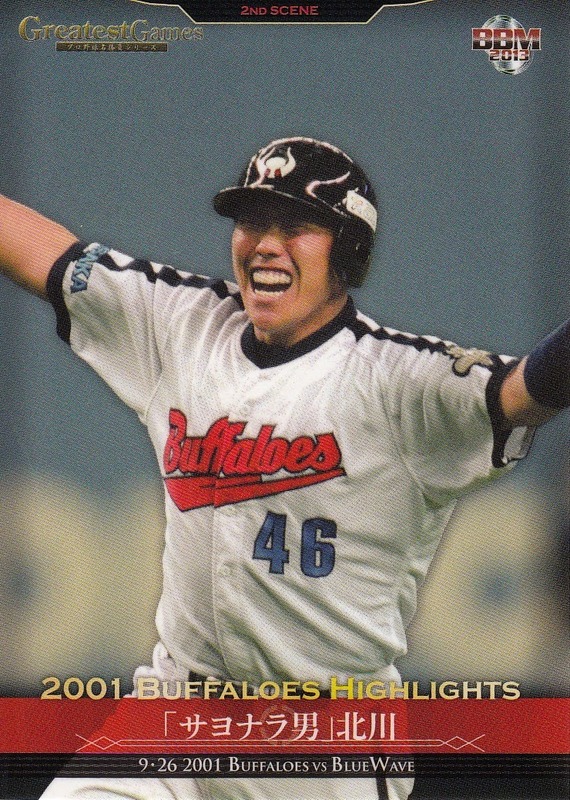 The third set, released in the summer of 2013, was for the September 26, 2001 game between the Osaka Kintetsu Buffaloes and the Orix Blue Wave. 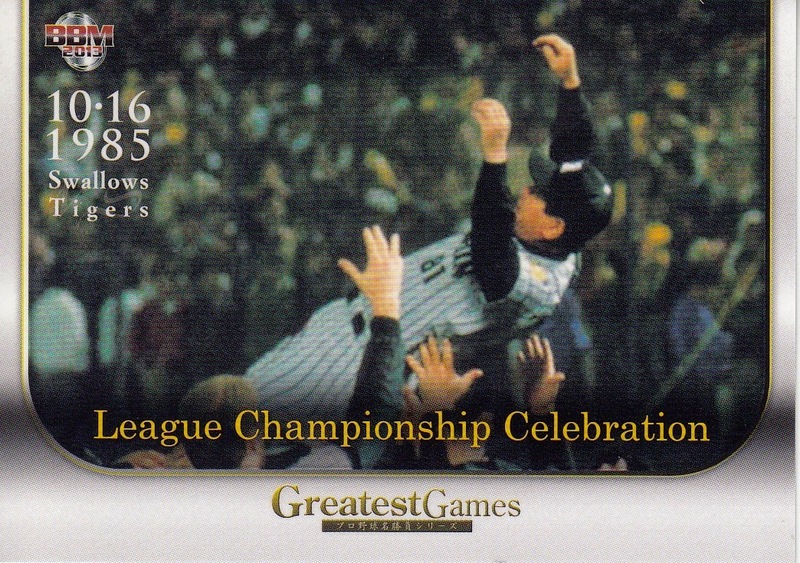 The Buffaloes won the game and clinched the Pacific League pennant on a pinch hit, walk off grand slam. 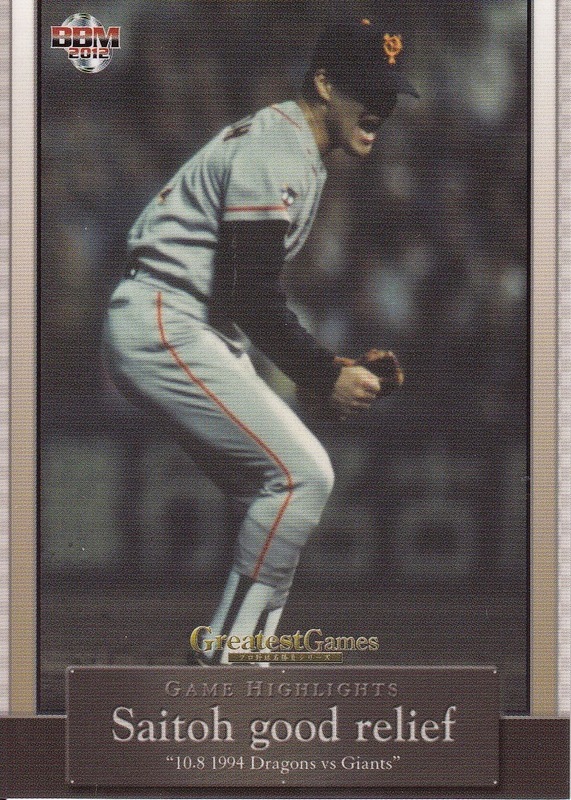 This is also a 36 card base set - 15 Blue Wave, 17 Buffaloes and four "2001 Buffaloes Highlights". 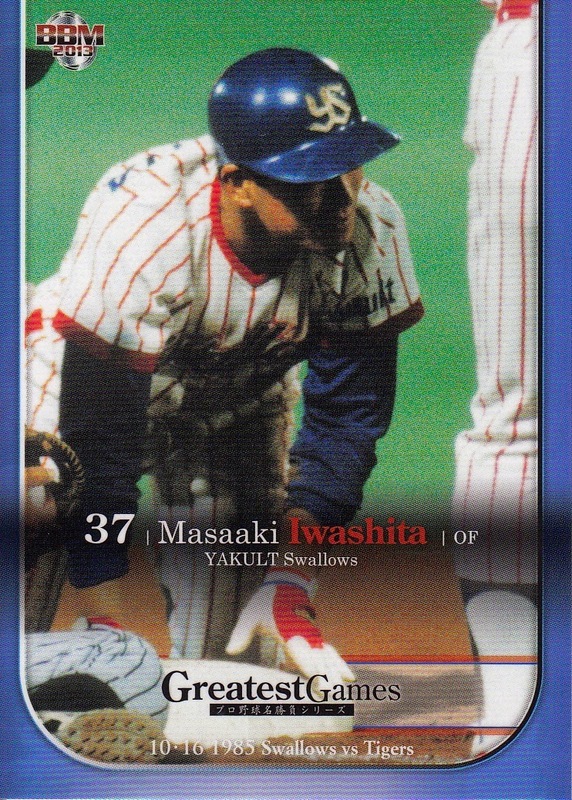 The final set, released last December, was for the October 16, 1985 game between the Tigers and the Swallows that ended in a 5-5 tie. 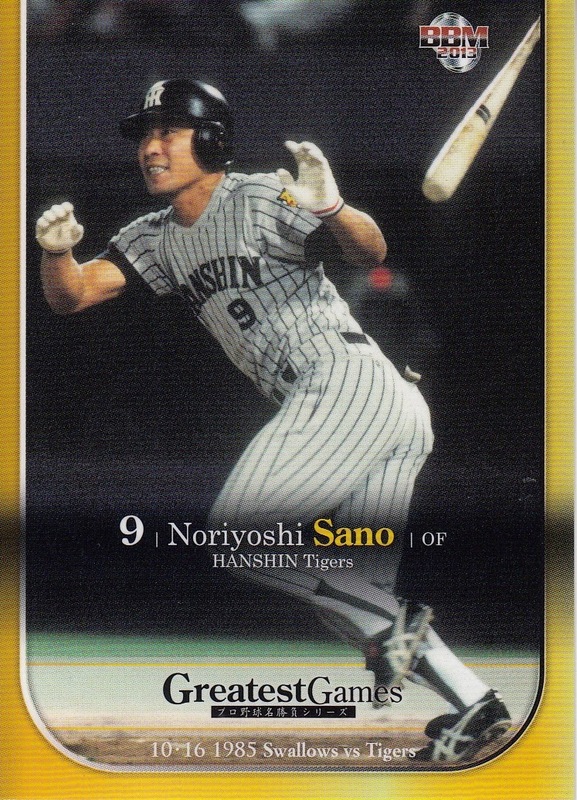 That tie enabled the Tigers to clinch their first Central League pennant in 21 years and helped propel them to their first (and still only) Nippon Series championship. 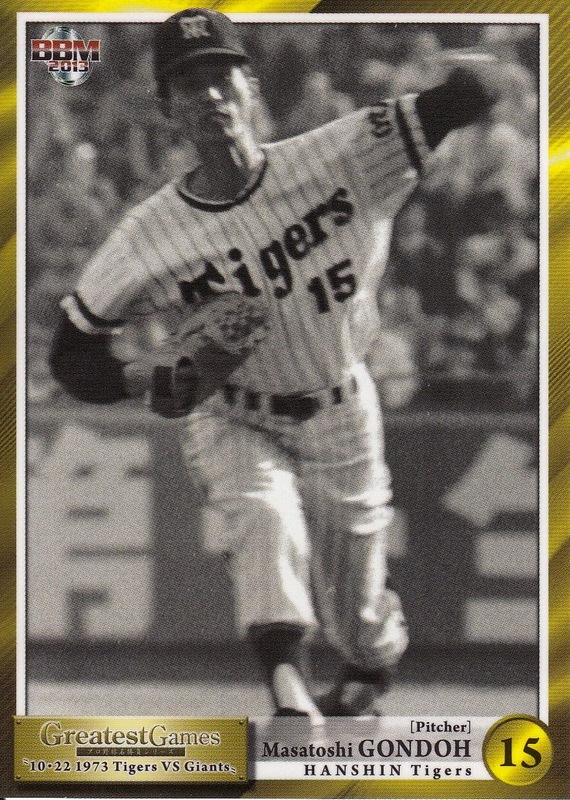 Once again, there were 36 cards in the base set - 20 Tigers, 15 Swallows and one highlight card. Frankly the set for the 2001 game stands out for a number of reasons - it's the only Pacific League game, it's the only game won by the home team and it's the only game that really seems like it would have been exciting to watch. Most importantly, it's the only set of the four that isn't fairly ugly. It's got a nice design and the photos are fairly clear - I suspect the latter is due to the fact that this particular game was played inside. I find the designs for the other three sets to be unattractive (well, the 1985 set isn't too bad) and the photographs used are very poor. The pictures in the 1994 set are very dark while the 1973 set uses black and white photos that may or may not have been taken at the actual game. Some of them are actually blurry. The 1985 set's photos are a little better than the 1994 ones but they are still pretty grainy. I'm a big fan of BBM's historic sets but I was pretty disappointed with these sets, with the exception of the 2001 game's set. It was an interesting idea, but the execution was poor. 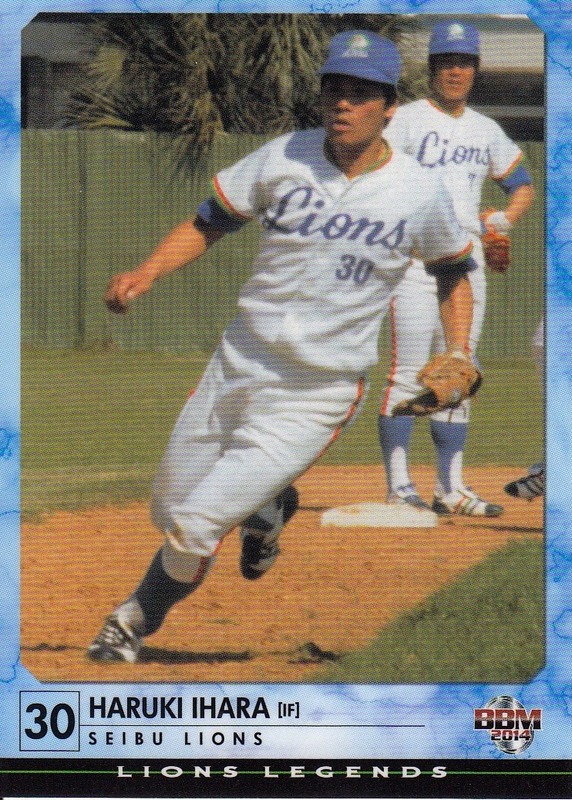 2001 was Ichiro Suzuki's first season in the major leagues and Calbee decided to commemorate it by printing up a reprint of one of their first cards of him and including it with their second (of two) series that year. 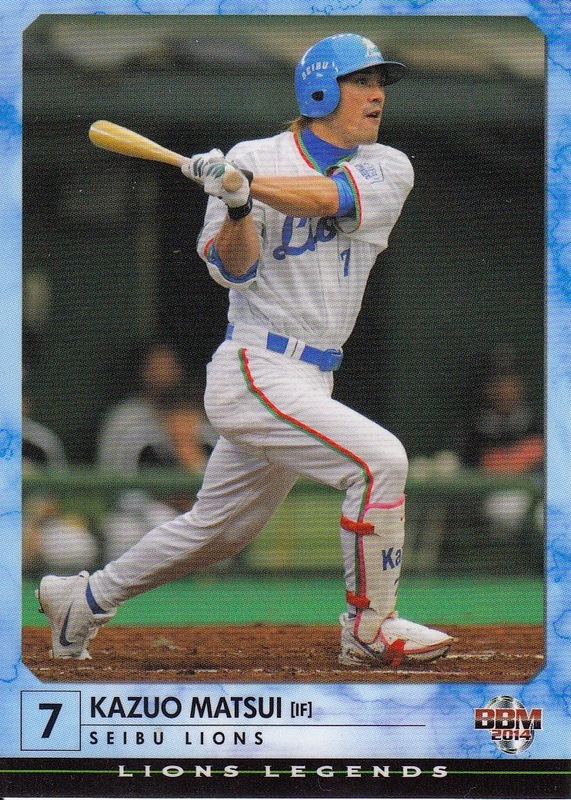 Ichiro's BBM rookie card was in the 1993 set but Calbee did not include a card of him in either of their regular sets in 1993 and 1994. 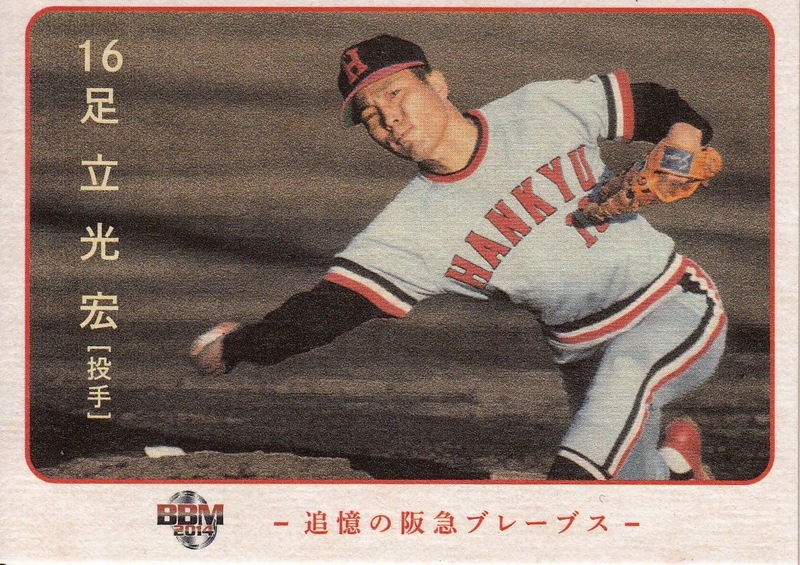 It wasn't until late in the 1994 season (which was Ichiro's breakout season) that they hastily added him to a small regional set they did that was only released for a short time in Hokkaido. 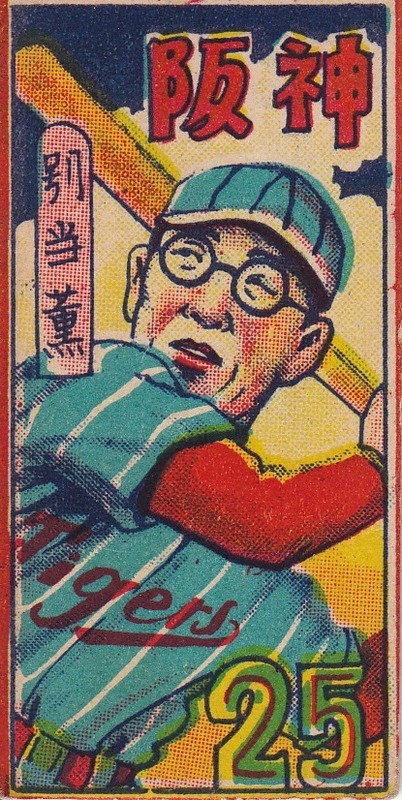 The set was originally 36 cards but Calbee added three cards of Ichiro to raise it to a total of 39. 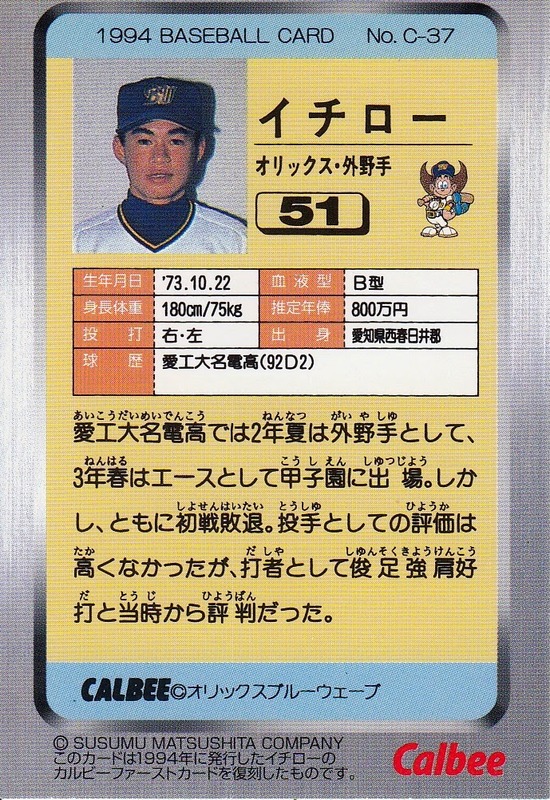 This gets into one of those hair-splitting technical debates about what counts as Ichiro's Calbee rookie card - is it in the 1994 Hokkaido regional set or the 1995 regular set? 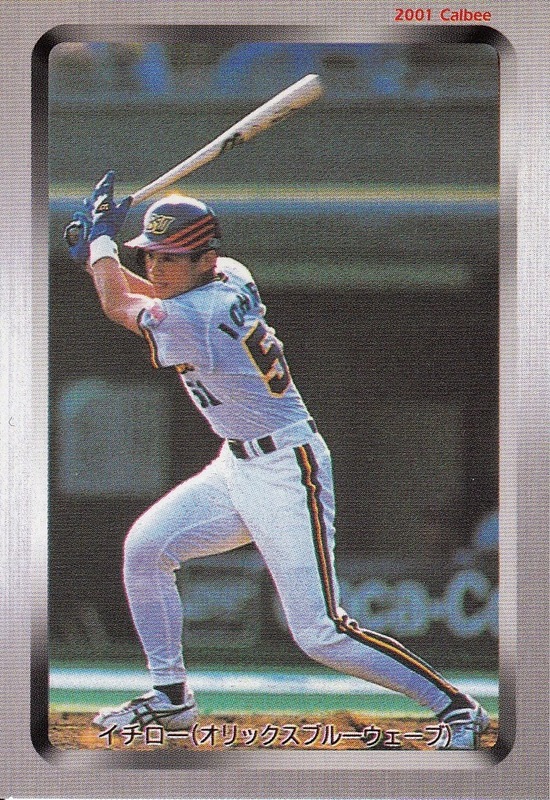 The market apparently has already decided which is the more valuable card - SCM #106 (the latest issue to include Calbee prices) lists the three 1994 cards at 7000 yen apiece with his 1995 cards (there are four in the set) at either 3000 yen (for the first series cards) or 5000 yen (for the second series cards). I was doing some looking around on Yahoo! 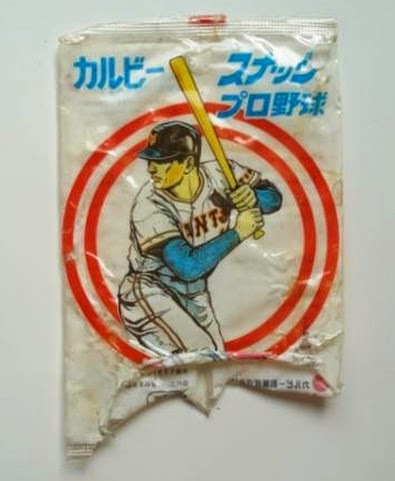 Japan Auctions the other day and I came across something I've never seen before - an empty bag for Calbee's Yakyu chips from 1973, the first year Calbee did baseball cards. I swiped the images from the auction to share here. As you can see, the bag's not in very good shape which isn't a surprise since it's almost 42 years old. 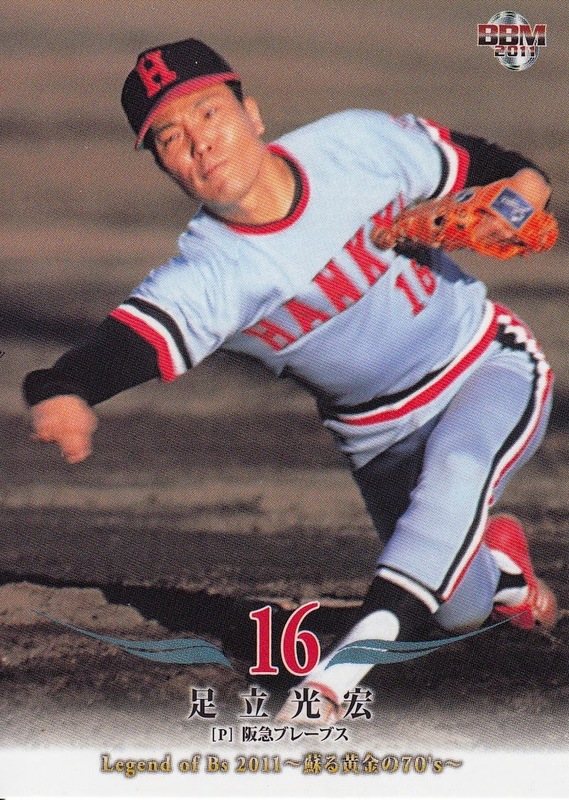 I was thinking recently that Hall of Fame pitcher Shigeru Sugishita had only played for the Dragons during his career. 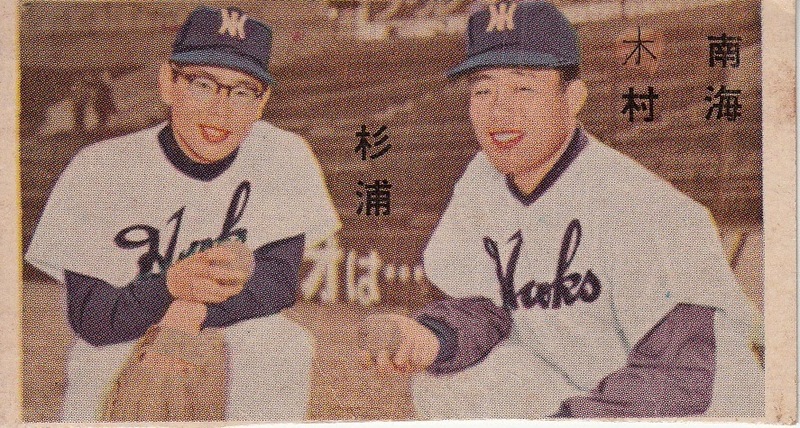 This turns out not to be the case - he spent the 1961 season (his last) with the Daimai Orions. 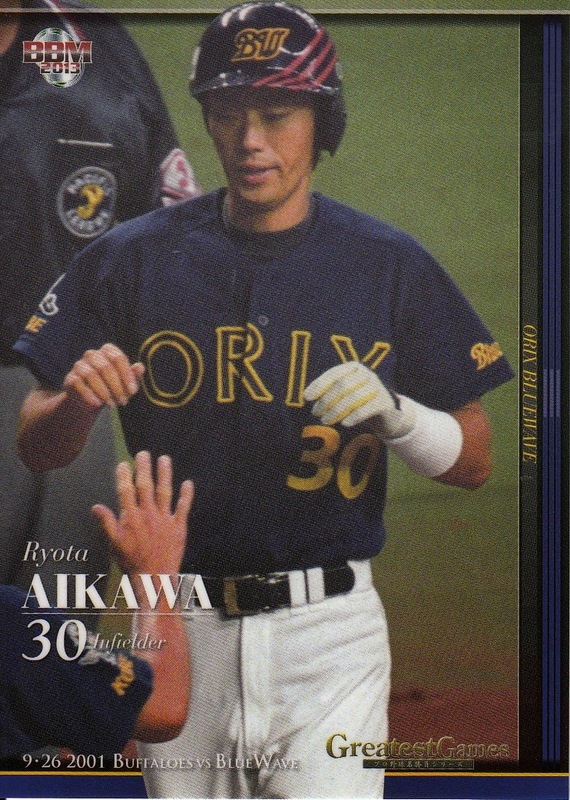 I was further surprised to see that one of his cards in the 2000 20th Century Best 9 shows him as an Orions player - I've had this card for a while so I must have completely forgotten about his Orions detour. 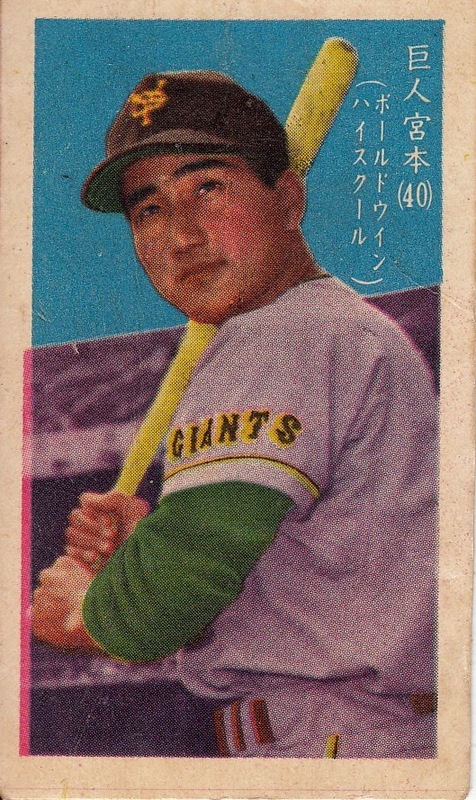 *I do need to mention that Gary Engel took a look at some of the cards I've posted and confirmed that the Shigeru Fujio card I have is a previously unknown card from the 1961 Marumatsu JCM 14d set. UPDATE - I received an email from Gary Engel today (12/14) with his comments on the cards. I'll add them to each of the paragraphs below. One thing that Gary did stress with me was the distinction between unknown cards and uncataloged cards. Just because a card is uncataloged doesn't mean it's unknown. 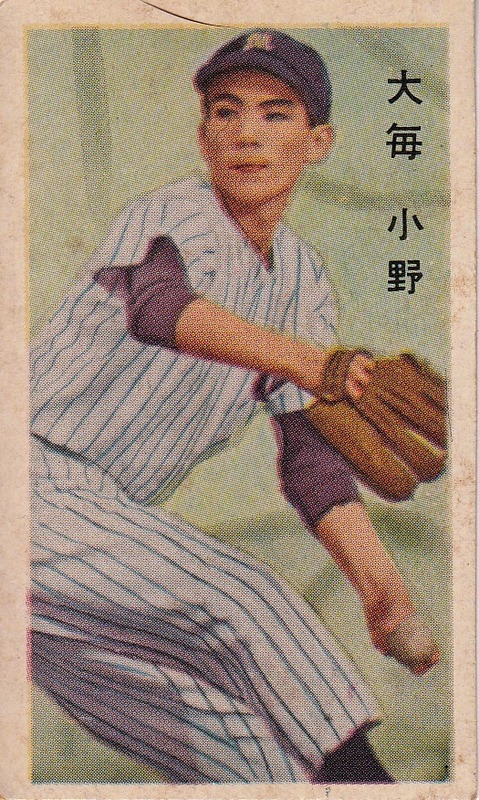 The final two cards appear to be from the 1961 Marukami JCM 14d set that I previously had found the new Fujio card for. 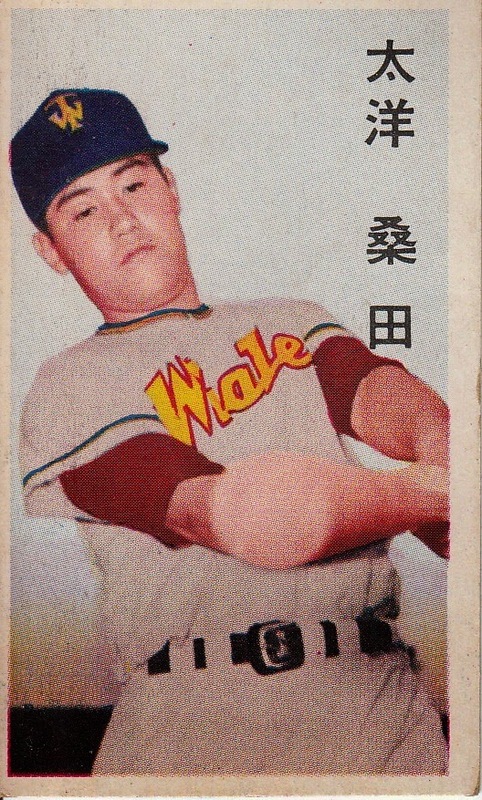 The first card is Takao Katsuragi of the Orions and the second card is Takeshi Kuwata of the Whales. 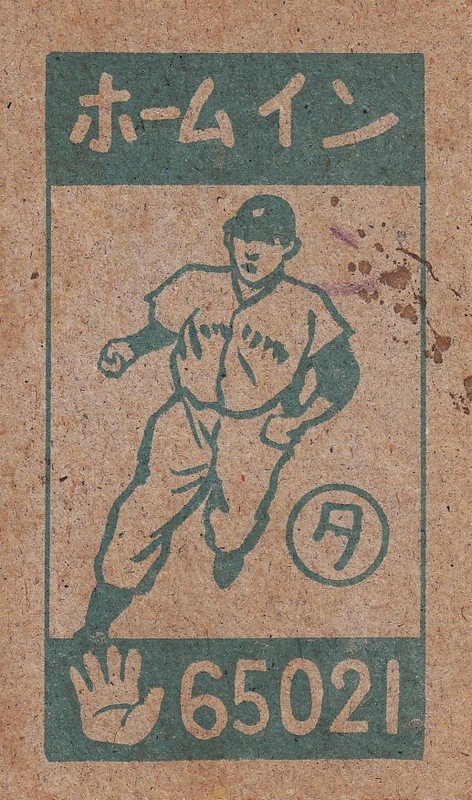 (Engel: Several months ago, Rob Fitts was looking through his collection of JCM 14d and discovered that it either has two printings, or there are two very similar sets. I had never collected this set, and much of my checklist relied on info given to me by Paul Margiott over 20 years ago, when we were putting together the first edition. Rob doesn't have a complete set, but noticed that there were two versions of many cards in the set, each having a different menko number. 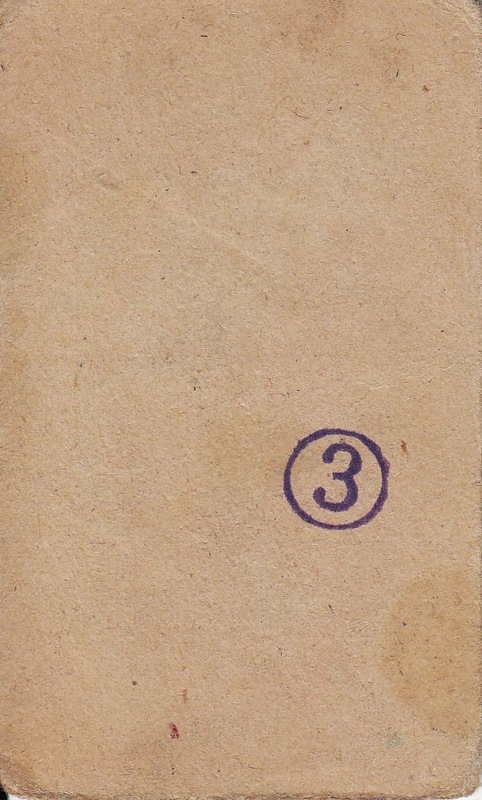 In all cases of cards with two versions, one was printed more crudely than the other, and that there are color variations between the two versions. 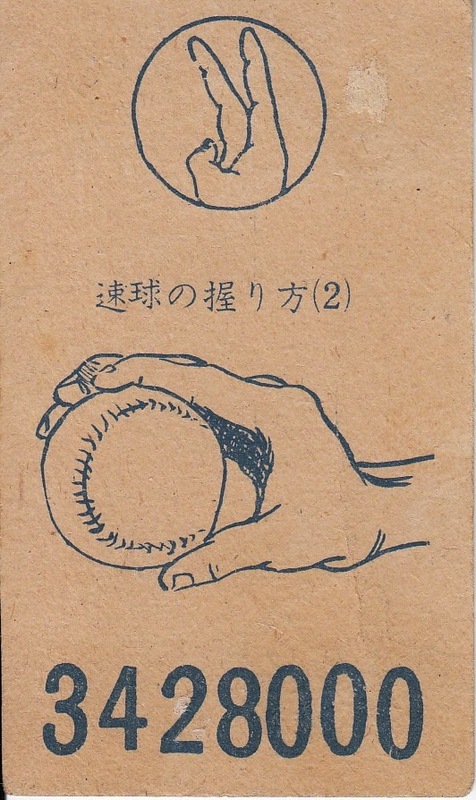 In many cases, where the guide checklist had two cards listed for a player, the two menko numbers simply indicated the two versions (I didn't know that), although there are some players who do have two cards with different images within the same version. If anyone can shed any light on these cards (or point out where I missed them in Engel), please let me know.